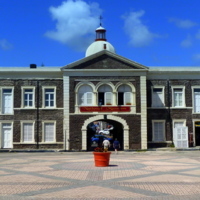 The National Museum of St Kitts is housed in the Old Treasury Building, built by the British colonial administration in 1894 and known as the 'gateway to Basseterre' due to its imposing size. The museum opened in 2002 and charts the history of St Kitts from its earliest, indigenous populations to its independence from colonial rule in 1983. The museum has three permanent galleries which cover St Kitts' history in a chronological timeline making use of a small collection of artefacts, alongside images and text panels. The first gallery examines the indigenous populations of the island, alongside exhibits relating to natural history and ecology. The second gallery explores the arrival of Europeans to the island and the development of slavery and the plantation economy. There are artefacts showcasing the brutal nature of enslavement, including an iron slave collar. It also explains the processes involved in the cultivation of sugar, as used on the plantations during the eighteenth and nineteenth centuries. 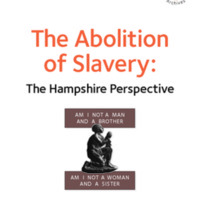 It also provides a narrative of abolition and emancipation. The final gallery examines the colonial governance of St Kitts post emancipation, through to independence from British rule in 1983. The Pompey Museum is named after a courageous enslaved man who led a slave revolt from the Rolle Plantation on Steventon, Exuma, Bahamas. Vendue House, where the museum is located, was built in the 1790s and operated as a market place where enslaved people and other goods were sold during the nineteenth century. The house was opened as a one-room museum in 1992 and was redeveloped in 2014. The museum is dedicated to the preservation and interpretation of the lived experience of enslaved people, particularly during transatlantic slavery, and its aftermath in The Bahamas. It features a small selection of objects and images that complement these themes. Following its redevelopment in 2014, the museum curated a powerful exhibition entitled 'Wade in The Water: Peter Mowell, the Last Slave Ship in The Bahamas' which charted the plight of the enslaved Africans on the slave ship that wrecked off Lynyard Cay in the Abacos in 1860. The National Museum of African American History and Culture opened in September 2016, after more than a century of development. 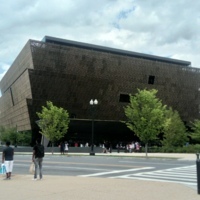 Designed to "tell the American story through the lens of African American history and culture," it forms the only national museum in the USA that is exclusively devoted to the documentation of African American history and culture. It stands on Washington's National Mall as the newest, nineteenth museum of the Smithsonian Institute. Established by an Act of Congress in 2003, the museum has had over one million visitors since its opening. The displays in the museum are divided into two halves. There are three history galleries, charting key events in the history of America, with specific reference to the experience of the African American community. These galleries begin with displays about Africa prior to the slave trade, showcasing the rich culture and advanced nature of civilisations there. 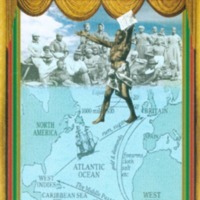 The displays then move on to enslavement, the Middle Passage and Plantation Life. In all of these displays, the experience of the enslaved people is central to the interpretation, and much use is made of archive material, providing quotations which bring the voices of the enslaved to the fore of the narrative. The displays in the history galleries go on to interpret abolition, reconstruction, emancipation and Civil Rights. They end with the inauguration of Barack Obama in 2009. The displays make use of a wealth of collections, some 36,000 objects now belong to the museum. The key to the narrative throughout all of these displays is the central position of African Americans to the national history of America. The other side of the museum consists of three 'community galleries.' Again these focus on the achievements of African Americans, through themes like sport, military, theatre, television, literature and art. Here, some of the museum's 'celebrity' artefacts, including Michael Jordan's NBA finals jersey and one of Jimi Hendrix's vests. This section of the museum also houses the 'Robert Frederick Smith Explore Your Family History Centre,’ where visitors can look at digitised archive material with expert guidance to explore their own family tree. 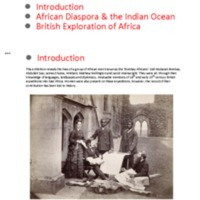 Bombay Africans 1850-1910 was exhibited at the Royal Geographical Society as part of the wider ‘Crossing Continents: Connecting Communities’ project, which with community partners aimed to develop new resources to advance the importance of geography. Based on the research of Clifford Pereira and with community consultation partners, Bombay Africans explored the histories of a group of African men who assisted British explorers such as John Hanning Speke, Richard Burton and David Livingstone on mapping expeditions in East Africa in the late 19th century. The name 'Bombay Africans' was given to Africans who had been rescued from the slave ships operating in the Indian Ocean. The exhibition examined the roles of these men in the anti-slavery movement and in Christian organisations like the Church Missionary Society. Focusing on the East Coast of Africa and the slave trade routes in the Indian Ocean, the exhibition also explored enslavement, forced migration, liberation and the African diaspora in the Asian subcontinent. The year-long programme of commemorative events from Camden Council was put together in consultation with the 1807-2007 Taskforce of local African and Caribbean community leaders. The key to these events was remembering slavery through the resistance of Africans, their celebration in their liberation and their unity in tackling present-day inequalities. Camden’s 18th and 19th Century Slavery Trail was created around the area. 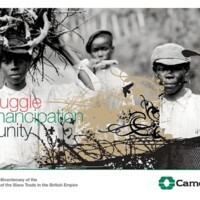 In eight stops, it explored the lives of men and women connected to the slave trade who lived and worked in the London Borough of Camden. The Resistance Film Season, in partnership with the British Museum, explored the legacy of the slave trade through a mixture of contemporary and classic films. Other events also included local exhibitions, poetry readings, debates and talks. A collaborative project between Churches Together in Northampton, English Heritage, Northamptonshire Black History Association (NBHA) and The Northampton Schools Excellence Cluster. Freedom From the Past: Long Time Coming was led by Mary Clarke, Director of the Doddridge Centre, where the NBHA office is based. The project commemorated the 1807 Act and the wider histories of black resistance and the fight against the slave trade through music, drama and historical workshops in Northampton. The 'Passage' event was held in St Giles' Church on 25 March 2007, an evening of drama, songs and speeches reflecting on the legacies of slavery. There was a 150-strong gospel-style community choir drawn from schools in the Northampton area and local community groups. The event was one of a range of project activities in Northampton which brought together schools, community groups, churches and heritage organisations to explore the issues of slavery in the British Empire. Other events included a community event and 'Walk to Freedom' at the Northampton West Indian Community Association (NWICA) to mark 'Emancipation Day', annually held throughout the Caribbean to celebrate the abolition of slavery. English Heritage funded a professional DVD recording which was afterwards made freely available to NBHA members and others. 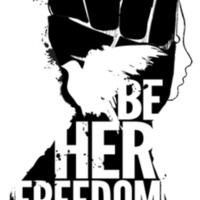 The Be Her Freedom campaign is part pf the A21 movement which comprises of individuals, organizations, government officials, and members of the public who are committed to abolishing injustice in the 21st century. The image replaces the shackled pleading hands of past antislavery campaigns with a clenched fist - a symbol of self-determination and self-liberation. This collaborative community initiative celebrated African and Caribbean culture in Leeds, with a focus on commemorating the Abolition Act by 'highlighting African achievement, liberation and aspirations'. 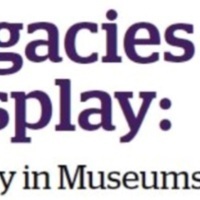 New exhibitions, publications and resources were produced and over 100 bicentenary events organised under different themes: Education and Museums; Arts and Carnival Culture; Churches and Abolition; Legacy; Black History and Community Development; Media and Communications. Highlights included the photographic exhibition and pamphlet 'From Abolition to Commonwealth', which remembered indentured labour in Africa and the Caribbean after 1807, and the 40th anniversary of Leeds West Indian Carnival, with themes that highlighted heritage, liberation, respect and freedom. Project outputs included an education pack, black history classes, concerts, church services, lectures and performances.